Sunday. Back squats 1x5 @ 135kg. Clean speed ladder (60 --> 100kg). Another session at Toni's Box. We went for a 2h walk in the morning with Pauliina as the weather was beautiful. Couldn't stay inside as the sun was shining and the spring is obviously coming big time. So in the afternoon it was bro-sesh with Toni. This is part of a progression that I've written in my head to get more strength in my legs. Today's focus was on taking one heavy set of 5's. Previously to this day I've done 7 sets, 5 sets and 3 sets of 5's at ascending weights. This set was fine too. It's been a while since going this heavy for a set of 5 reps so this was encouraging for sure. Toni had a vision in his mind. 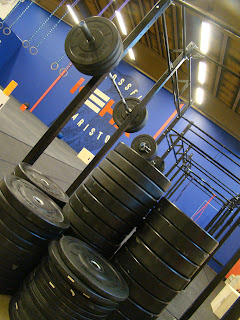 This requires a lot of space, lots of barbells and a ton of weights so it's not self-evident that you can do this stuff. Today we were at the gym just the two of us as the Box has not officially yet opened. They have arranged classes where people can get familiar with crossfit but officially it's going public in April. It took a while to load the barbells to the desired weights. We decided to start at 60kg, then add 5kg to each bar to reach a total of 100kg on the heaviest of them. That means it's gonna be 9 bars in total. Great workout! This was the first time ever doing anything similar to this so it was a bit difficult to approach it. Had no idea what kind of work capacity I might have on cycling this kind of barbells. Maybe it tells something that my times improved every lap compared to the previous one. All came within the 1-minute frame. First one 59 seconds and the last one 50 seconds. I've sure this could have been completed faster still. I just started to get a clue of this one in the end. Awesome workout!